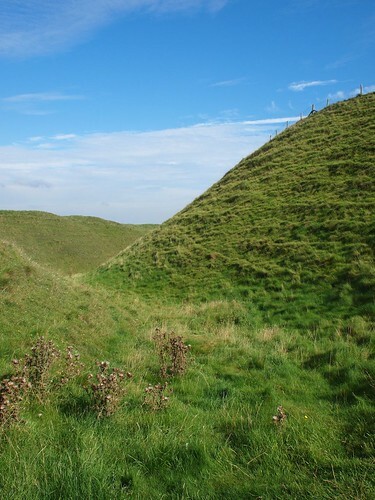 Maiden Castle is Britain’s biggest hill fort built over a Neolithic causwayed camp. It really is big too! You will need stamina to climb up the ramparts, even with the handy steps in them although going in by the west gate is easier. I last visited Maiden Castle as a teenager in the 1970s and it was an experience that kindled my lifelong enthusiasm for prehistoric monuments. This was probably helped by the still current interpretation of events at Maiden Castle in 43AD. Sir Mortimer Wheeler had excavated the castle in the 1930s and was of the opinion that Vespasian’s legionaries had assaulted and captured the castle, thus causing its decline. So climbing the ramparts with visions of Roman soldiers slogging up them in testudo formation covered by their ballistae firing bolts at the defenders was a powerful image. Naturally it inspired me to paint some Hinchliffe Roman Legionaries, aided by Graham Watson’s book on the Roman Army and illustrations by the Embletons in Military Modelling. Excavations in the 1980s lead to this version of events being overturned. Wheeler’s war cemetery was seen as the result of tribal raiding rather than Roman sturm und drang. Rather than being crushed under the Roman boot the site was abandoned as people moved to the new settlement of Dorchester. 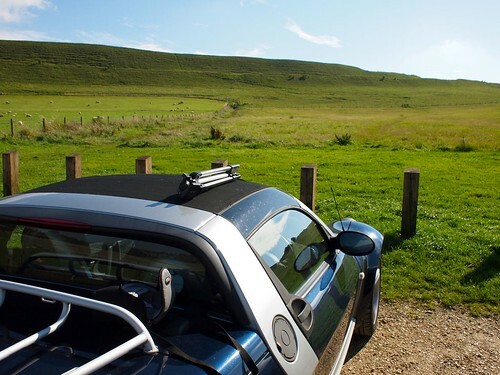 Maiden Castle is a complex beast with several stages of occupation and development. A walk around the ramparts is a must if only to appreciate how big this place is. IF you need a breather pause and admire the complexity of the west gate with its double entrance. Perhaps an early customs barrier? A very impressive long barrow cuts across part of the central fort and the stone faced east gates still impress. There are also the remains a fifth century AD Roman Temple from the last phase of activity. 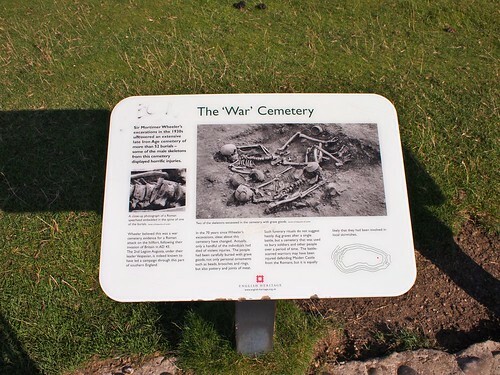 English Heritage maintain the site well and have put clear interpretation boards in place. The sheep find them excellent scratching posts! Finds can be seen in nearby Dorchester. Numerous pebbles to be used as sling stones were found at Maiden Castle. I always wonder if Iron Age mothers sent restless children off to the coast to collect the pebbles as a way of keeping them busy! Looking along the ditch between the northern ramparts - fence for scale!